In this section we will examine propeller engines. Examples of propeller-powered vehicles are shown in Figures 11.22 and 11.23. 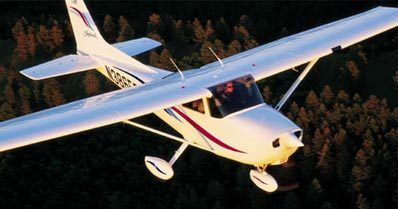 Each propeller blade is a rotating airfoil which produces lift and drag, and because of a (complex helical) trailing vortex system has an induced upwash and an induced downwash. 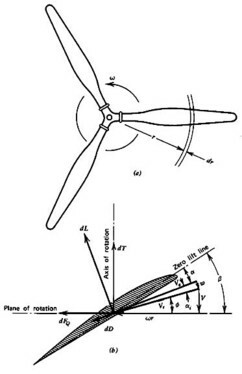 Figure 11.24 shows a schematic of a propeller. It is possible to integrate the relationships as a function of with the appropriate lift and drag coefficients for the local airfoil shape, but determining the induced upwash ( ) is difficult because of the complex helical nature of the trailing vortex system. 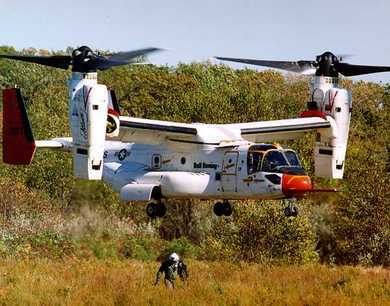 In order to learn about the details of propeller design, it is necessary to do this. 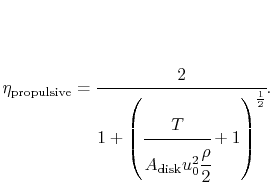 However, for our purposes, we can learn about the overall performance features using the integral momentum theorem, some further approximations called ``actuator disk theory,'' and dimensional analysis. Note that the last term is identically equal to zero by conservation of mass. If the mass flow in and out of the propeller streamtube are the same (as we have defined), then the net mass flux into the rest of the control volume must also be zero. This is the same expression as we arrived at before for the jet engine (as you might have expected). Neglect rotation imparted to the flow. Assume the Mach number is low so that the flow behaves as an incompressible fluid. 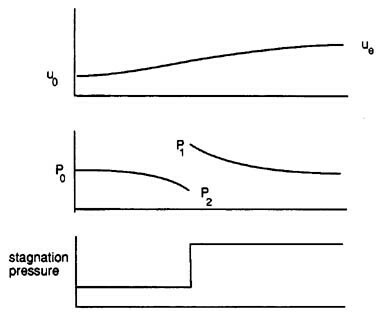 Assume the flow outside the propeller streamtube has constant stagnation pressure (no work is imparted to it). Assume that the flow is steady. Smear out the moving blades so they are one thin steady disk that has approximately the same effect on the flow as the moving blades (the ``actuator disk''). Across the actuator disk, assume that the pressure changes discontinuously, but the velocity varies in a continuous manner. Figure 11.26: Schematic of actuator disk model (Kerrebrock). We then take a control volume around the disk as shown in Figure 11.27. 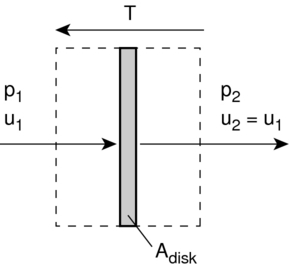 Figure 11.27: Control volume around actuator disk. Half of the axial velocity change occurs upstream of the disk and half occurs downstream of the disk. We generally don't measure or control directly. Therefore, it is more useful to write our expressions in terms of flight velocity , thrust, , (which must equal drag for steady level flight) and propeller disk area, . There are several important trends that are apparent upon consideration of these equations. We see that the propulsive efficiency is zero when the flight velocity is zero (no useful work, just a force), and tends towards one when the flight velocity increases. In practice, the propulsive efficiency typically peaks at a level of around 0.8 for a propeller before various aerodynamic effects act to decay its performance as will be shown in the following section. We will now use dimensional analysis to arrive at a few important parameters for the design and choice of a propeller. Dimensional analysis leads to a number of coefficients which are useful for presenting performance data for propellers. We can now consider the three terms in the square brackets. where is called the thrust coefficient and in general is a function of propeller design, Re, and . where is called the torque coefficient and in general is a function of propeller design, Re, , and . Typical propeller performance curves are shown in Figures 11.28, 11.29, and 11.30. 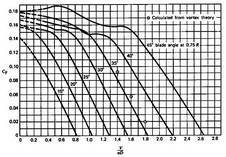 Figure 11.28: Typical propeller efficiency curves as a function of advance ratio ( ) and blade angle (McCormick, 1979). 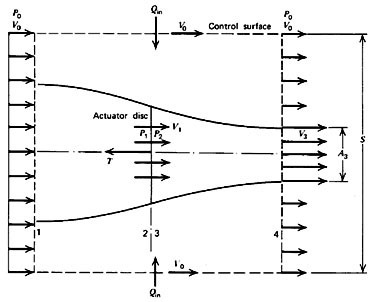 Figure 11.29: Typical propeller thrust curves as a function of advance ratio ( ) and blade angle (McCormick, 1979). 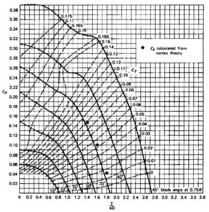 Figure 11.30: Typical propeller power curves as a function of advance ratio ( ) and blade angle (McCormick, 1979).